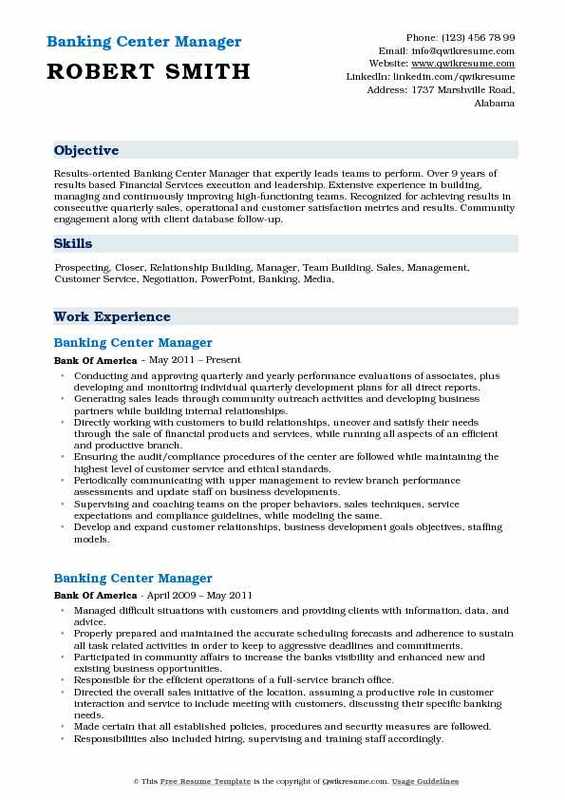 Banking Center Manager oversees the Banking center’s daily operations and executes various other roles and responsibilities pertaining to this managerial role. 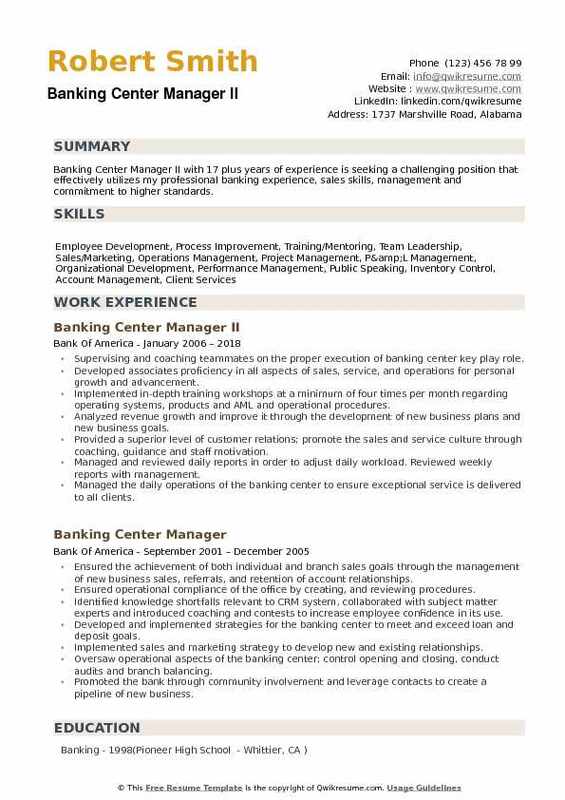 The most vital duties incorporated and displayed out in the Banking Center Manager Resume falls nothing short of the following – supervising service and sales employees within the center, overseeing staff compliances with bank laws and policies, hiring and training new employees, managing staff to achieve the center’s goals and standards, conducting associate performance evaluations, reviewing staff performance, implementing new business assessment processes, assessing local market conditions, identifying sales prospective opportunities and locating areas of improvement. Candidates should possess sound knowledge of bank operations and its products/services, they should also have a strong decision-making and leadership skill, additionally, they are expected to possess computer skills and have ample sales experience. Banking Center managers come from varying educational backgrounds, but most of the eligible candidates display a degree in the field of Accounting, Finance or Administration. 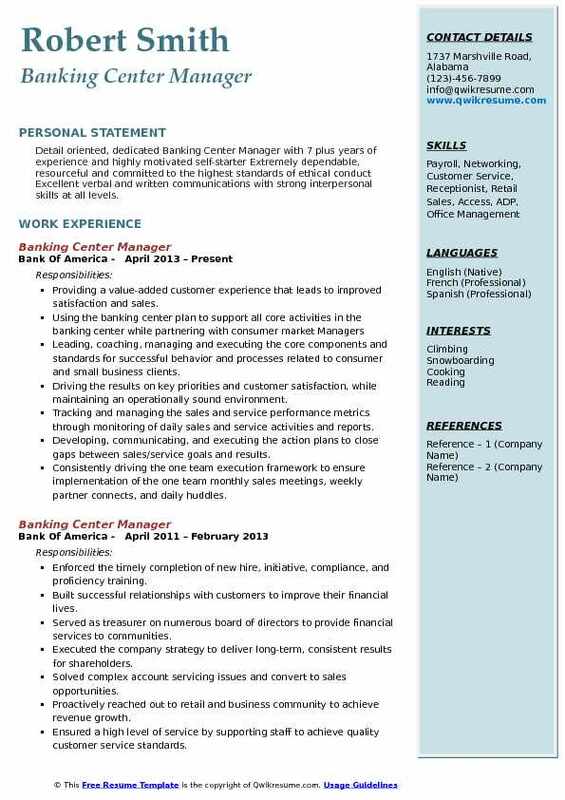 Summary : Banking Center Manager with 7 years of experience in the Finance domain is seeking to obtain a Customer Service position that will allow me to utilize and display my analytical, interpersonal, communication, networking, managerial, strong customer service and organizational skills. Proven ability to identify needs, capture opportunities, adhere to policy and procedures with readiness to identify the needs of requirements and establish plans and processes to ensure successful results. Oversaw the operations of the banking center to ensure customer satisfaction and a friendly atmosphere with compliance with all laws, regulations, policies, and procedures to ensure protection to employees and bank assets. Coordinated operational issues including automation and equipment needs, workflow and transaction integrity. Maintained a properly trained staff and provide guidance, support, and back up to team members such as new accounts and teller line. Maximized the growth and profitability of the branch through direct calling efforts, cross-selling and assisting commercial officers with sales calls. Promoted/marketed the branch and its products along with the support of the development of annual plans. Ensured a high level of customer service, problem-solving with any customers and /or complaints update team members with risk assessments utilizing current data abiding with compliance regulations. Coordinated legal documentation to ensure compliance to various regulations. 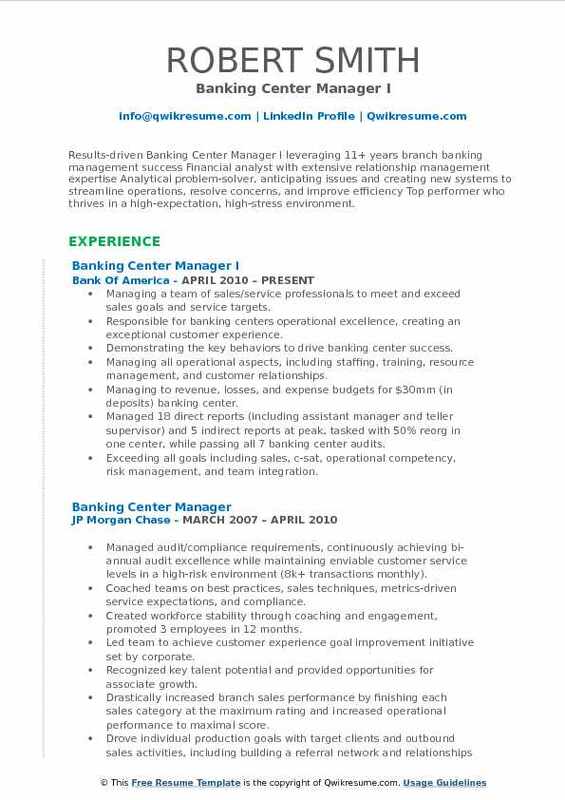 Summary : Results-driven, collaborative and analytical Banking Manager IV with more than twenty-two years of experience overseeing sales growth, mentoring teams and providing world-class client services. Emphasizes targeted and comprehensive professional development to nurture expertise among team members, coaching personnel on relevant best practices and customer service strategies. Identifies unique opportunities to expand portfolios, drive new business and foster continuous growth. Coaching, training and mentoring four direct reports. Providing extensive professional development on tactics to build the client base. Teaching the personnel about the value and benefits of leveraging personal relationships to nurture mutually beneficial solutions and drive sales. Engaging proactively with prospective customers to build key partnerships and develop viable business opportunities. Establishing and defining all standardized sales goals, emphasizing continuous improvement methodologies to maximize deposit growth, credit card sales, and other metrics. Successfully fostered $10mm increase in assets within the first year. Received significant recognition for elevating the team to rank within top 5 out of more than 580 store locations based on JD power customer satisfaction scores. Developing new reporting structures and other procedures to enhance long-term planning and metric analysis. Measuring all sales goals across quarterly, semi-annual and annual segments, conducting comprehensive operational reviews to ensure branch-wide efficiency and productivity. Ensured. 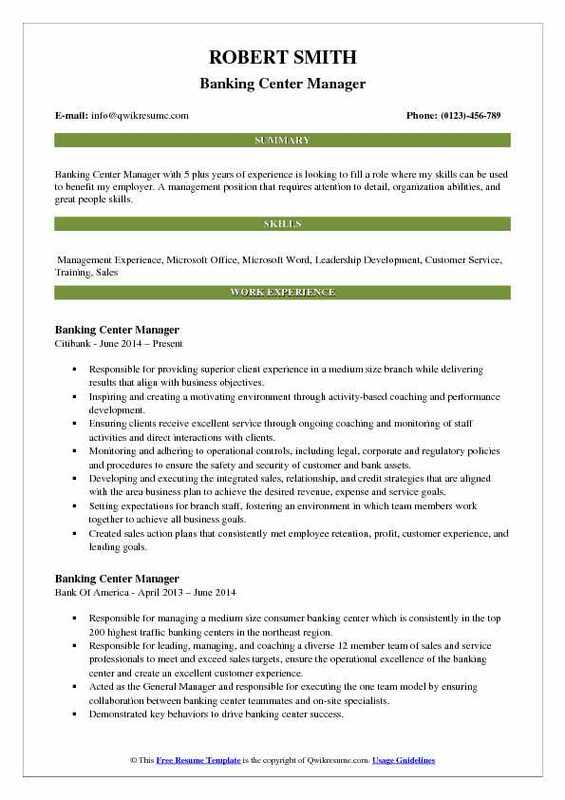 Headline : Banking Center Manager with 5 plus years of experience is looking to fill a role where my skills can be used to benefit my employer. A management position that requires attention to detail, organization abilities, and great people skills. Responsible for providing superior client experience in a medium size branch while delivering results that align with business objectives. Inspiring and creating a motivating environment through activity-based coaching and performance development. Ensuring clients receive excellent service through ongoing coaching and monitoring of staff activities and direct interactions with clients. Monitoring and adhering to operational controls, including legal, corporate and regulatory policies and procedures to ensure the safety and security of customer and bank assets. Developing and executing the integrated sales, relationship, and credit strategies that are aligned with the area business plan to achieve the desired revenue, expense and service goals. Setting expectations for branch staff, fostering an environment in which team members work together to achieve all business goals. Created sales action plans that consistently met employee retention, profit, customer experience, and lending goals. Summary : Results-driven Banking Center Manager I leveraging 11+ years branch banking management success Financial analyst with extensive relationship management expertise Analytical problem-solver, anticipating issues and creating new systems to streamline operations, resolve concerns, and improve efficiency Top performer who thrives in a high-expectation, high-stress environment. Skills : P&L Management, Project/Portfolio Management, Auditing/compliance, Demonstrated Success in driving new Revenue, Growth Forecasting, Trend Analysis, Profitability Analysis/Market Share Growth, C-level Reporting, Pricing Estimates, Project Scope, Design. Managing a team of sales/service professionals to meet and exceed sales goals and service targets. Responsible for banking centers operational excellence, creating an exceptional customer experience. Demonstrating the key behaviors to drive banking center success. Managing all operational aspects, including staffing, training, resource management, and customer relationships. Managing to revenue, losses, and expense budgets for $30mm (in deposits) banking center. Managed 18 direct reports (including assistant manager and teller supervisor) and 5 indirect reports at peak, tasked with 50% reorg in one center, while passing all 7 banking center audits. Exceeding all goals including sales, c-sat, operational competency, risk management, and team integration. Identifying and managing the compliance/operational risk in every business, product, and service transaction. Reduced attrition from 60% to zero in one center through workforce stability, cultivating engaged team. Creating/delivering all associates performance evaluations, determining merit increases/bonus amounts. Summary : Detail oriented, dedicated Banking Center Manager with 7 plus years of experience and highly motivated self-starter Extremely dependable, resourceful and committed to the highest standards of ethical conduct Excellent verbal and written communications with strong interpersonal skills at all levels. Providing a value-added customer experience that leads to improved satisfaction and sales. Leading, coaching, managing and executing the core components and standards for successful behavior and processes related to consumer and small business clients. Driving the results on key priorities and customer satisfaction, while maintaining an operationally sound environment. Tracking and managing the sales and service performance metrics through monitoring of daily sales and service activities and reports. Developing, communicating, and executing the action plans to close gaps between sales/service goals and results. Consistently driving the one team execution framework to ensure implementation of the one team monthly sales meetings, weekly partner connects, and daily huddles. Coaching the associates and specializes in proficiency and productivity, in compliance with regulations and policy, through observation and providing actionable feedback. 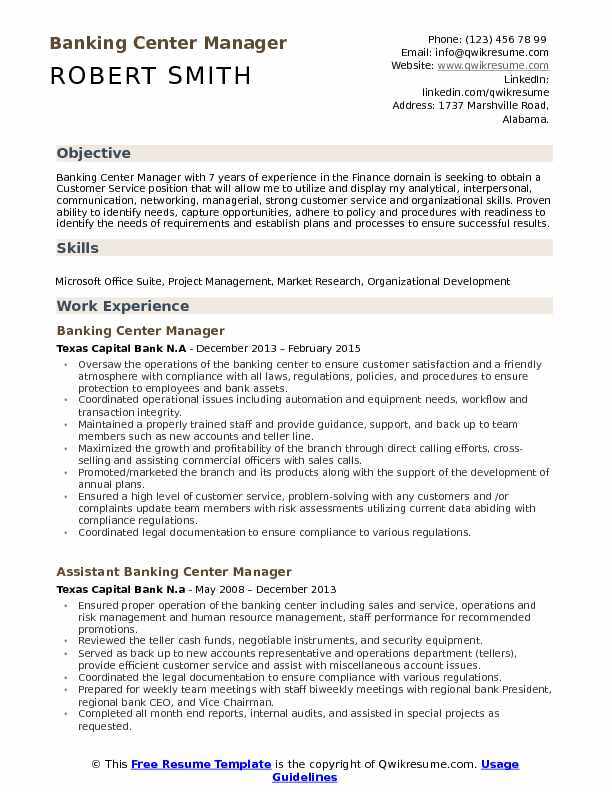 Summary : Results-oriented Banking Center Manager that expertly leads teams to perform. Over 9 years of results based Financial Services execution and leadership. Extensive experience in building, managing and continuously improving high-functioning teams. Recognized for achieving results in consecutive quarterly sales, operational and customer satisfaction metrics and results. Community engagement along with client database follow-up. Conducting and approving quarterly and yearly performance evaluations of associates, plus developing and monitoring individual quarterly development plans for all direct reports. Generating sales leads through community outreach activities and developing business partners while building internal relationships. Directly working with customers to build relationships, uncover and satisfy their needs through the sale of financial products and services, while running all aspects of an efficient and productive branch. Ensuring the audit/compliance procedures of the center are followed while maintaining the highest level of customer service and ethical standards. Periodically communicating with upper management to review branch performance assessments and update staff on business developments. Supervising and coaching teams on the proper behaviors, sales techniques, service expectations and compliance guidelines, while modeling the same. Develop and expand customer relationships, business development goals objectives, staffing models. Create monthly sale contests to encourage staff to reach weekly/monthly goals. 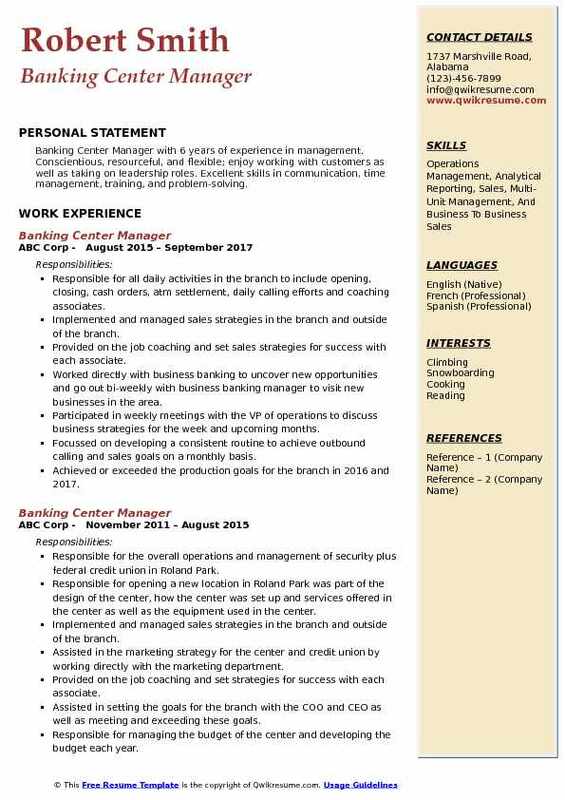 Summary : Accomplished and energetic Banking Center Manager II with 15 plus years of experience with a solid history of achievement in banking. A motivated leader with strong organizational and prioritization abilities. Implementing annual performance appraisals for staff with frequent coaching and development to include formalized monthly one on one sessions tracking progress towards. Coaching the team to deliver expert financial advice to customers with regard to lending, investing, traditional banking, and recommending clients to appropriate business partners when appropriate. Collecting the customer feedback and making the process changes to exceed customer satisfaction. Developing the annual branch business plan for maximum profitability and effectiveness. Generating new business through attendance of networking events, establishing on-site presentations for large corporations and conducting regular sales calls to the surrounding. Achieved over 100% of annual sales goals for both branch and individual team sales. Establishing and maintaining strong relationships with members of the community through volunteering and attending public events. Maintaining effective working relationships with all departments seeking feedback and best. 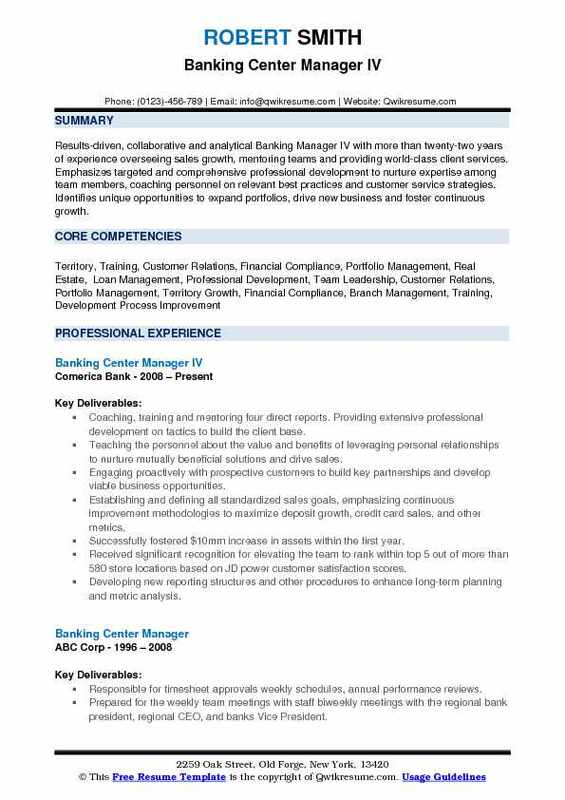 Summary : Well-respected Banking Center Manager with 14 years of experience, blending an extensive background in sales with solid business management. Detail-focused, results-oriented, highly motivated, fast-learner, self-sufficient. Strong leader with multi-tasking abilities. Remains calm under pressure. Experience reflects continuous professional growth. Developing strategic sales strategies to meet and exceed targets while continually motivating employees to meet and surpass these. Cultivating effective relationships with new and existing customers by assessing their needs and advising them on the suitability of services to meet those needs while consistently maintaining the highest levels of customer. Establishing strong bonds with business customers by personally visiting them and attending meetings and conferences with them and other professionals. Maintaining overall accountability for products and services, such as consumer lending, current account transactions, unsecured loans, overdrafts, credit cards, and personal loans. Manage and provide oversight of day to day sales and service fulfillment activities, including operational excellence and regulatory compliance related to those activities. Provide first-rate customer service by identifying and addressing customer concerns and inquiries. Ensure the growth of new and existing client base through outbound calling efforts on a weekly basis on a consumer and business level. 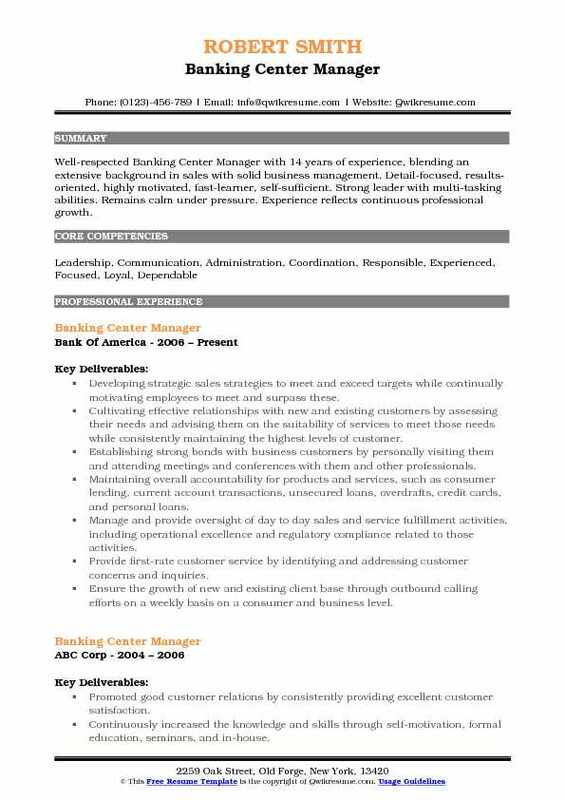 Headline : Banking Center Manager with 6 years of experience in management. Conscientious, resourceful, and flexible; enjoy working with customers as well as taking on leadership roles. Excellent skills in communication, time management, training, and problem-solving. Responsible for all daily activities in the branch to include opening, closing, cash orders, atm settlement, daily calling efforts and coaching associates. Implemented and managed sales strategies in the branch and outside of the branch. Provided on the job coaching and set sales strategies for success with each associate. Worked directly with business banking to uncover new opportunities and go out bi-weekly with business banking manager to visit new businesses in the area. Participated in weekly meetings with the VP of operations to discuss business strategies for the week and upcoming months. Focussed on developing a consistent routine to achieve outbound calling and sales goals on a monthly basis. Achieved or exceeded the production goals for the branch in 2016 and 2017. Increased loan production on average by 20% each year over the goal and increased account production by 10% each year over the goal. Worked directly with the VP of operations to improve and develop new processes and procedure for the credit union, manage reports and projects as assigned by the VP of operations. Participated in community outreach and fundraising programs in and around Harford County. Summary : Banking Center Manager II with 17 plus years of experience is seeking a challenging position that effectively utilizes my professional banking experience, sales skills, management and commitment to higher standards. Supervising and coaching teammates on the proper execution of banking center key play role. 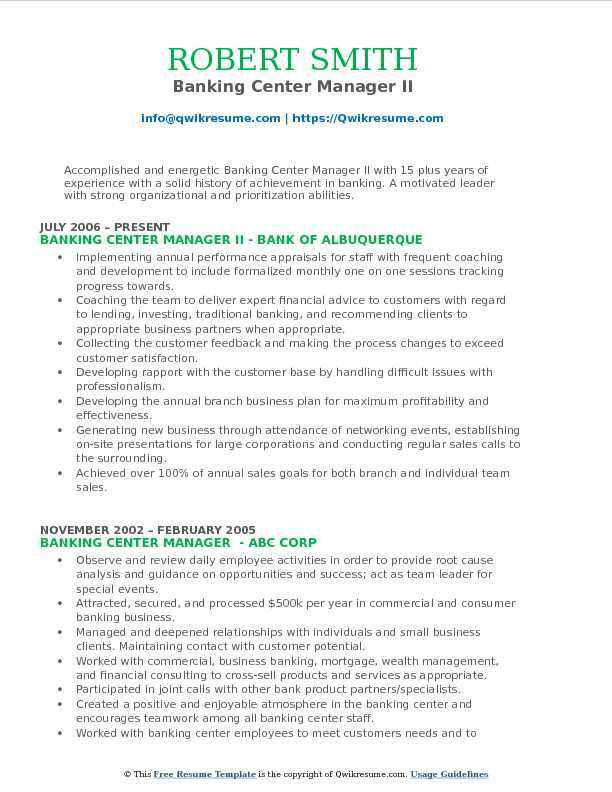 Developed associates proficiency in all aspects of sales, service, and operations for personal growth and advancement. Implemented in-depth training workshops at a minimum of four times per month regarding operating systems, products and AML and operational procedures. Analyzed revenue growth and improve it through the development of new business plans and new business goals. Provided a superior level of customer relations; promote the sales and service culture through coaching, guidance and staff motivation. Managed and reviewed daily reports in order to adjust daily workload. Reviewed weekly reports with management. Managed the daily operations of the banking center to ensure exceptional service is delivered to all clients.